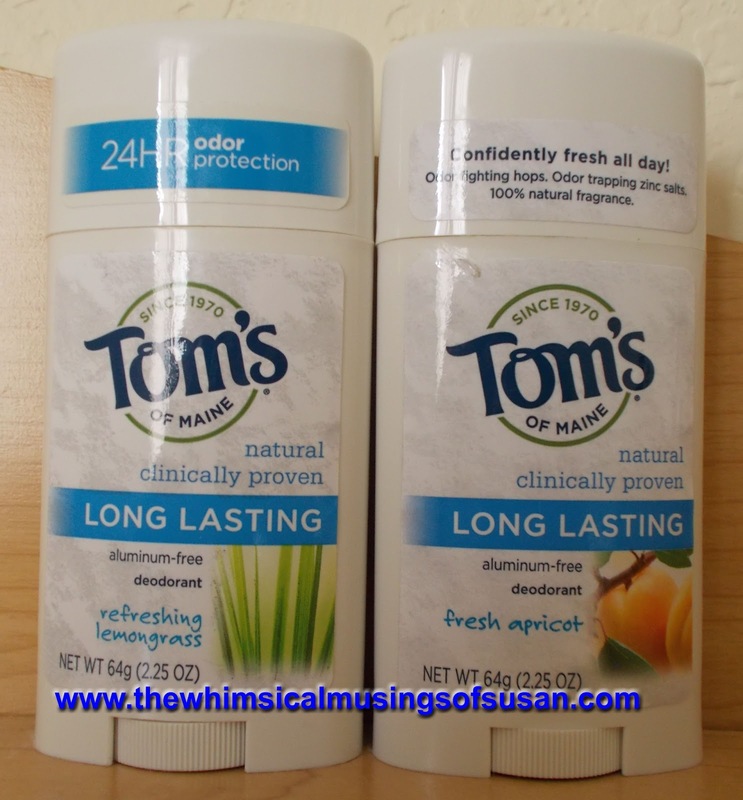 This is a review of Tom's of Maine Long Lasting Care Deodorant, aluminum free. 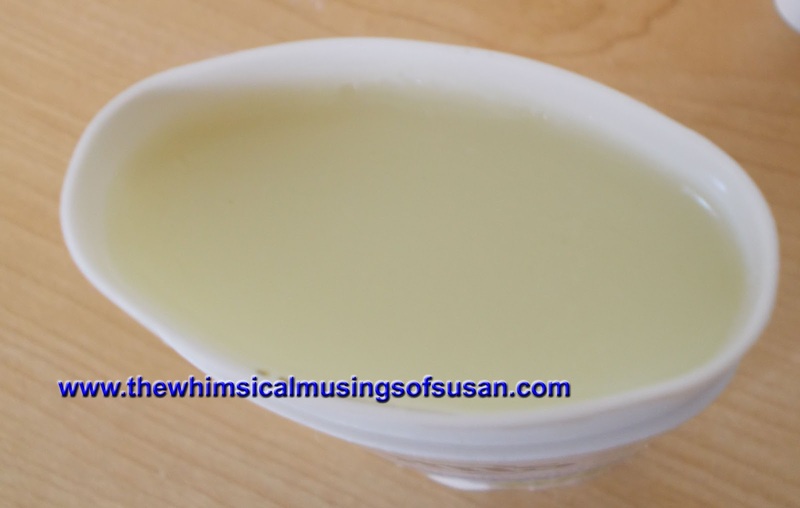 It is manufactured by Tom's of Maine, a company that prides itself on producing great quality, natural products that aren't tested on animals. 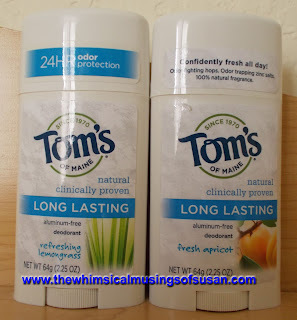 Tom's of Maine Long Lasting deodorants are available at most retailers like CVS, Target, Walmart, etc. I think that the place you could find this product cheapest is at Walmart for about $3. I used a $1.00 coupon, so I paid even less than that when I bought it at Walmart a few weeks, ago. The size that I purchased was the 64 g (2.25 oz.) container. The variety that I am trying right now is fresh apricot. It is has very mild fruity scent. I don't really care all that much for the scent but it doesn't smell bad, either. This is my first time ever trying Tom's of Maine deodorants or any "natural" deodorants for that matter. The manufacturer says that the deodorant provides 24 hour odor protection. I was skeptical and curious as to whether a natural deodorant could be that effective. Most mainstream deodorants contain aluminum salts, such as aluminum chlorodryate. Many people have the mistaken belief that they can reduce their risk of breast cancer by avoiding the use of aluminum containing deodorants. There is a misconception going around that aluminum containing deodorants cause breast cancer. I don't buy into this and call it a myth. I have not heard any conclusive evidence that aluminum salts increase the risk of developing breast cancer. I still do believe that it is better to expose yourself to as few synthetic chemicals as possible. So, I can definitely see where a product like Tom's of Maine Long Lasting Deodorant would appeal to some people. Upon first application of this deodorant, I had this very slight burning sensation in my armpits. This lasted for about a few minutes. I got the same sensation for the first three or four days that I used the product. After that, I didn't experience the burning. I didn't have any allergic reaction or redness. I was wondering about that, so I went to the product website to see if anyone else had the same sensation. As far as I could tell, no one else had the same exact experience. There were a few people that complained that the product caused redness and irritation, though. This deodorant is in a gel stick form. So, it goes on rather smoothly, without clumping or flaking. An added benefit to using aluminum-free deodorants is that they do not leave permanent stains on your clothing. Aluminum salts in deodorants are notorious for causing those yellow marks in the armpits area of garments. 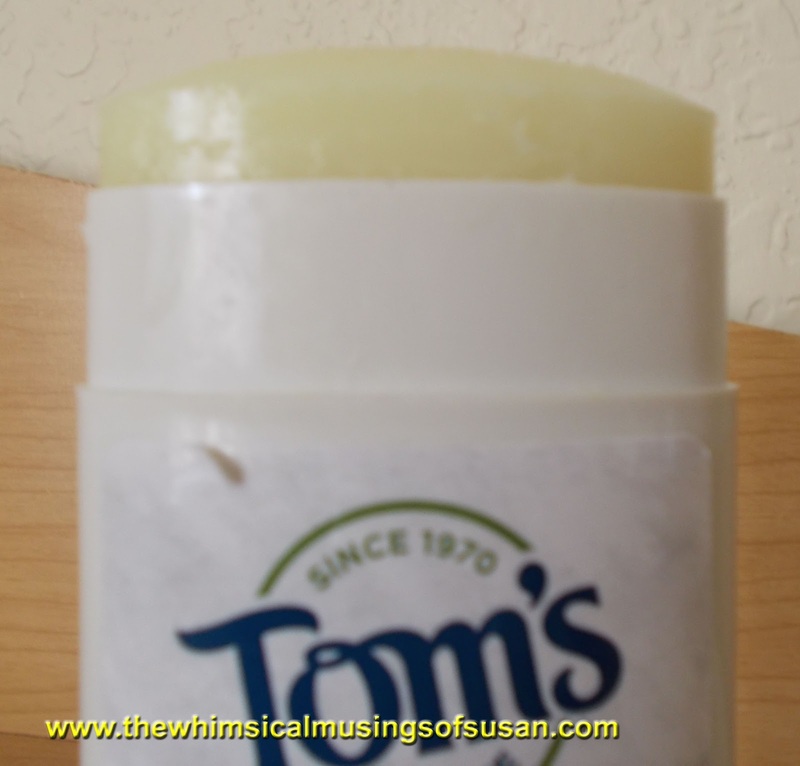 I tried Tom's of Maine Long Lasting deodorant for a week straight before I formed a final opinion about it. This product definitely protected me from perspiration and odor. I used it while working and through activities where I would sweat heavily, too. Therefore, I am satisfied with the results and would recommend it. This product is manufactured by Tom's of Maine, Inc. For more information about the product, call 1-800-FOR-TOMS or visit www.tomsofmaine.com.